With recent advances in HPLC columns and LC/MS hardware, it is possible to increase the throughput of bioanalytical assays without sacrificing quality. 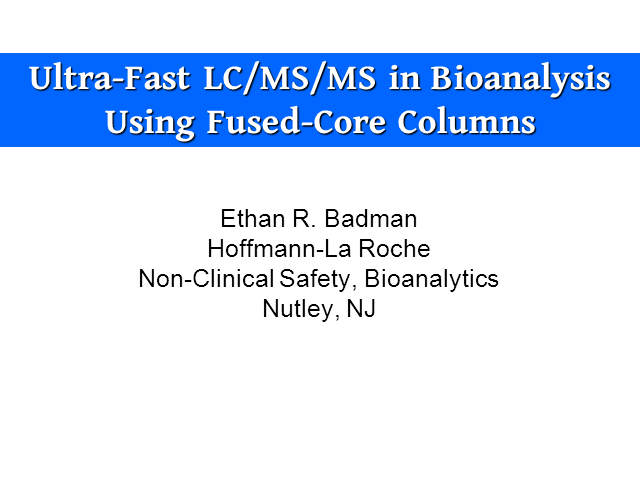 By using fused-core columns, it is possible to decrease the run time from ~4 min to 1 min or less, without the use of UHPLC hardware. High quality methods at high flow rates (1-3 mL/min) using non-ballistic gradients as short as 20 seconds were developed that provide comparable or better performance for accuracy, precision, sensitivity, and specificity than traditional slower LC methods. Data will be presented that show that these assays meet regulatory requirements for bioanalytical work. Limitations in the ultimate speed possible for these assays will also be discussed. Presented by: Ethan R. Badman, Ph.D.